Even if Cisco can’t figure out what to do in the consumer camcorder market, Toshiba doesn’t seem to be having any problems: the company has just introduced the Camileo BW10 to its camcorder line. And unlike many consumer camcorders that care comparatively fragile and delicate, the Camileo BW10 is designed to stand up to more rugged activities—even underwater, where it can operate when submerged up to six and a half feet. The Camileo BW10 features a two-inch LCD display and weighs just 3.5 ounces, so it’s easy to carry around in a pocket or bag. The camera shoots 1080p video in MP4 H.264 format or five megapixel JPG images, and stores material to removable microSD/SDHC/SDXC cards, meaning users can have up to 64 GB of storage. Toshiba says the camera can shoot about 70 minutes of video on a single battery charge, and the BW10 features HDMI output for showing images and video on a separate HDTV (although you’ll need to buy a separate HDMI accessory cable). The camera also has convenience features like a 10× digital zoom, face detection and chasing, and an “Easy YouTube” upload button that enables users to push their hard work to YouTube for the whole world to see. 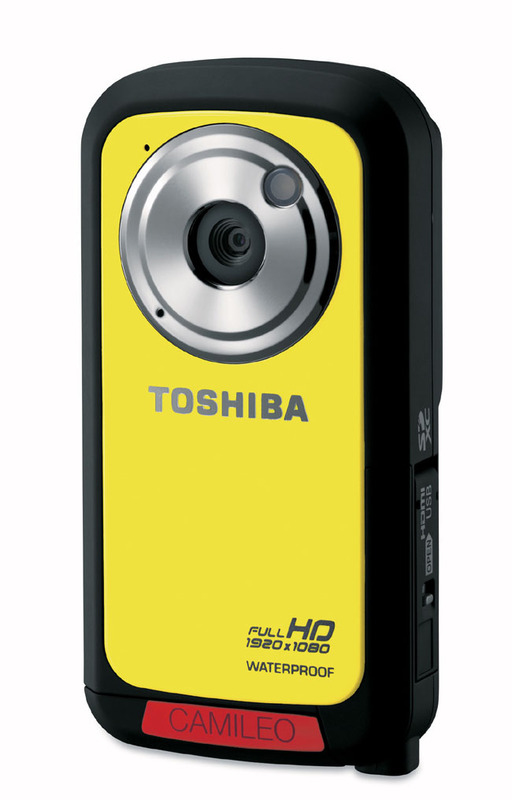 The Camileo BW10 is available now in yellow and silver (there may also be a blue model) for a suggested price of $149.99, although right now Toshiba is offering it for $129.99—and there’s a special offer through April 30 that includes a 16 GB memory card in that price.